Your day-by-day itinerary now includes Auckland Zoo as well as Piha Beach. Get a sense of the local culture at Auckland Museum and Coast-to-Coast Walkway. Visit Manukau Heads Lighthouse and Parnell for their historical value. And it doesn't end there: don't miss a visit to Sky Tower, take in the architecture and atmosphere at St. Patrick's Cathedral, and steep yourself in history at Howick Historical Village. To see reviews, where to stay, ratings, and more tourist information, use the Auckland itinerary planner. If you are flying in from Singapore, the closest major airports are Auckland International Airport and Hamilton International Airport. In April in Auckland, expect temperatures between 23°C during the day and 23°C at night. Cap off your sightseeing on the 19th (Wed) early enough to travel to Waiheke Island. Start off your visit on the 20th (Thu): learn about winemaking at Mudbrick Vineyard, learn about winemaking at Goldie Vineyard, then make a trip to Headland Sculpture on the Gulf, and finally examine the collection at Whittaker's Musical Museum. Get ready for a full day of sightseeing on the next day: identify plant and animal life at Onetangi Forest and Bird Reserve, then learn about winemaking at Batch Winery, and then admire the masterpieces at Connells Bay Sculpture Park. To see reviews, where to stay, ratings, and other tourist information, read our Waiheke Island trip itinerary builder. Traveling by combination of car and ferry from Auckland to Waiheke Island takes 2 hours. April in Waiheke Island sees daily highs of 23°C and lows of 23°C at night. Finish up your sightseeing early on the 21st (Fri) so you can travel to Kaitaia. Kaitaia is a town in the Far North District of New Zealand, at the base of the Aupouri Peninsula, about 160 km northwest of Whangarei. Start off your visit on the 22nd (Sat): examine the collection at Butler Point Whaling Museum, then kick back and relax at Rarawa Beach, and then kick back and relax at Tapotupotu Beach. On the 23rd (Sun), you'll have a packed day of sightseeing: examine the collection at Mathew's Vintage Museum and then enjoy the sand and surf at Ninety Mile Beach. To see where to stay, photos, other places to visit, and other tourist information, go to the Kaitaia trip generator. The Route module can help you plan travel from Waiheke Island to Kaitaia. Wrap up your sightseeing by early afternoon on the 23rd (Sun) to allow enough time to travel to Whangarei. Whangarei is the northernmost city in New Zealand and the regional capital of Northland Region. On the next day, enjoy some diversion at Adventure Forest, enjoy the sand and surf at Ocean Beach, and then pause for some photo ops at Waka 'n' Wave Sculpture. To find more things to do, ratings, reviews, and tourist information, refer to the Whangarei travel planner. Drive from Kaitaia to Whangarei in 2.5 hours. Finish your sightseeing early on the 25th (Tue) so you can travel to Hot Water Beach. 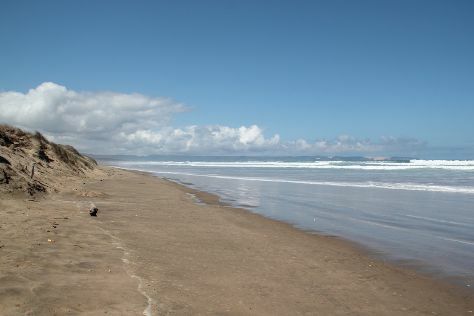 Start off your visit on the 26th (Wed): kick back and relax at Opoutere Surf Beach and then tour the pleasant surroundings at Hot Water Beach. Here are some ideas for day two: kick back and relax at Matarangi Beach and then enjoy the sand and surf at The Dunes Golf Resort. For traveler tips, other places to visit, reviews, and tourist information, read Hot Water Beach trip generator. Traveling by car from Whangarei to Hot Water Beach takes 4.5 hours. Wrap up your sightseeing by early afternoon on the 28th (Fri) to allow enough time to travel to Rotorua. Your day-by-day itinerary now includes Redwoods, Whakarewarewa Forest as well as Wai-O-Tapu Thermal Wonderland. Start off your visit on the 28th (Fri): delve into the lush surroundings at Redwoods, Whakarewarewa Forest. 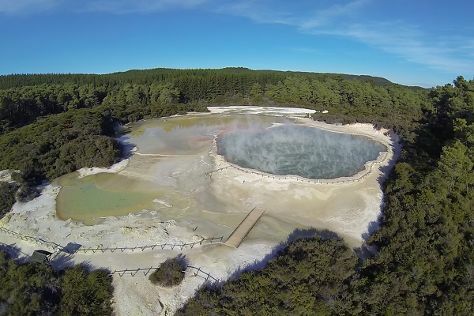 On the 29th (Sat), you'll have a packed day of sightseeing: witness a stunning natural landmark at Wai-O-Tapu Thermal Wonderland, make a trip to Te Puia, then contemplate the long history of Tamaki Maori Village, and finally traverse land and water with a duck tour. To find traveler tips, ratings, and other tourist information, go to the Rotorua itinerary builder. Traveling by car from Hot Water Beach to Rotorua takes 3 hours. Finish your sightseeing early on the 30th (Sun) so you can drive to Taupo. Kick off your visit on the 1st (Mon): take in the dramatic scenery at Huka Falls, then look for gifts at Huka Honey Hive, then take in the exciting artwork at L'Arte, and finally see the interesting displays at Taupo Museum. On the next day, engage your brain at Volcanic Activity Centre, then enjoy the sand and surf at Kinloch Beach, and then appreciate the extensive heritage of Opepe Scenic and Historic Reserve. For maps, ratings, traveler tips, and other tourist information, you can read our Taupo sightseeing planner. You can drive from Rotorua to Taupo in an hour. Alternatively, you can take a bus. Finish up your sightseeing early on the 2nd (Tue) so you can travel to Wellington. 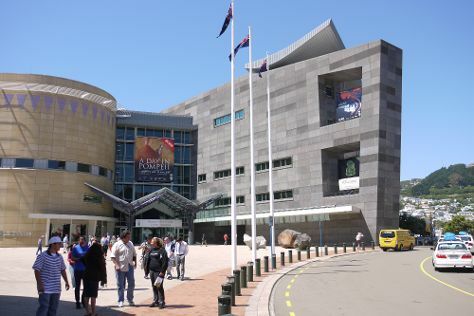 Start off your visit on the 3rd (Wed): tour the pleasant surroundings at Scorching Bay, then get a taste of the local shopping with The Weta Cave, and then examine the collection at Museum of New Zealand Te Papa Tongarewa. On the 4th (Thu), you'll have a packed day of sightseeing: get engrossed in the history at The Great War Exhibition, appreciate the history behind Pukeahu National War Memorial, see the interesting displays at Cable Car Museum, admire the landmark architecture of Old St Paul's, then take an in-depth tour of Wellington Museum, and finally take a memorable ride with Wellington Cable Car. To see traveler tips, ratings, more things to do, and tourist information, read Wellington vacation planner. Traveling by flight from Taupo to Wellington takes 2.5 hours. Alternatively, you can drive; or take a bus. In May, plan for daily highs up to 18°C, and evening lows to 12°C. Wrap up your sightseeing on the 5th (Fri) early enough to travel to Dunedin. 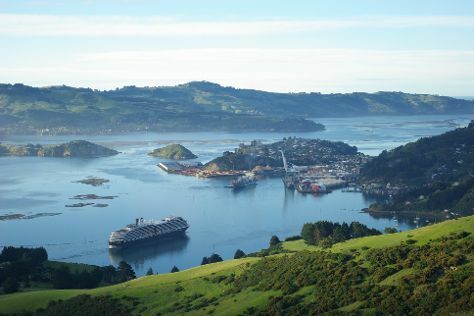 Otago Peninsula has been added to your itinerary. Kick off your visit on the 5th (Fri): get from place to place with Dunedin Railway Station. On the 6th (Sat), you'll have a packed day of sightseeing: examine the collection at Toitu Otago Settlers Museum, then steep yourself in history at Larnach Castle & Gardens, then explore the striking landscape at Otago Peninsula, and finally take in the architecture and atmosphere at First Church Of Otago. To see more things to do, photos, traveler tips, and more tourist information, you can read our Dunedin vacation trip planner. You can do a combination of flight and bus from Wellington to Dunedin in 4.5 hours. Another option is to take a bus. Wrap up your sightseeing on the 7th (Sun) to allow time to drive to Te Anau. Your day-by-day itinerary now includes Doubtful Sound. Kick off your visit on the 8th (Mon): trot along with a tour on horseback, then take an unforgettable tour with a helicopter tour, and then contemplate the waterfront views at Doubtful Sound. On your second day here, see what you can catch with a fishing tour. For more things to do, traveler tips, reviews, and other tourist information, use the Te Anau trip itinerary planner. You can drive from Dunedin to Te Anau in 4 hours. Another option is to take a bus. On the 10th (Wed), wrap the sightseeing up by early afternoon so you can drive to Milford Sound. Carved by glaciers into a land of sheer cliffs, impressive waterfalls, and lush, meandering fjords, Milford Sound remains one of the most popular holiday destinations in New Zealand. On the 11th (Thu), you'll have a packed day of sightseeing: add some adventure to your tour with a kayaking and canoeing tour and then examine the collection at Southern Discoveries - Milford Discovery Centre and Underwater Observatory. 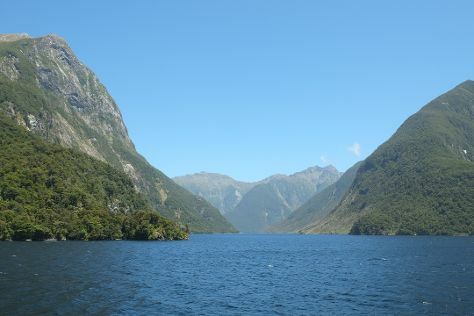 For traveler tips, other places to visit, maps, and more tourist information, refer to the Milford Sound tour planner. Traveling by car from Te Anau to Milford Sound takes 2 hours. Alternatively, you can take a bus. You'll set off for Lake Tekapo on the 12th (Fri). Located in a UNESCO Dark Sky Reserve, Lake Tekapo offers evenings of stargazing and days of long walks. On the 13th (Sat), you'll have a packed day of sightseeing: look and learn at Geraldine Observatory, then see the interesting displays at Geraldine Vintage Car & Machinery Museum, and then see the interesting displays at The Giant Jersey. To see reviews, maps, where to stay, and tourist information, use the Lake Tekapo itinerary maker. You can drive from Milford Sound to Lake Tekapo in 6.5 hours. Alternatively, you can take a bus. You will have some time to spend on the 15th (Mon) before leaving for Christchurch. On the 15th (Mon), take in the architecture and atmosphere at Christchurch Cathedral. Get ready for a full day of sightseeing on the 16th (Tue): get engrossed in the history at Canterbury Museum, then contemplate the long history of Riccarton House & Bush, then see the interesting displays at International Antarctic Centre, and finally don't miss a visit to Cardboard Cathedral. To find photos, ratings, more things to do, and other tourist information, use the Christchurch tour planner. Drive from Lake Tekapo to Christchurch in 3 hours. Alternatively, you can take a bus. May in Christchurch sees daily highs of 17°C and lows of 5°C at night. 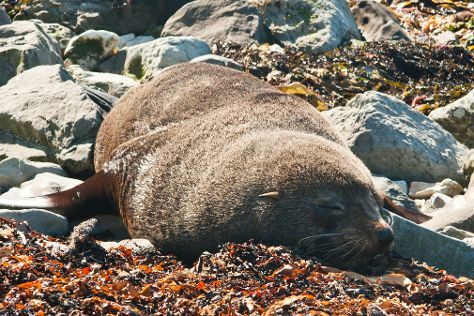 Finish up your sightseeing early on the 17th (Wed) so you can go by car to Kaikoura. On the 18th (Thu), identify plant and animal life at Peninsula Seal Colony, contemplate the long history of Fyffe House, and then take in the exciting artwork at Art & Design Gallery. On the 19th (Fri), you'll have a packed day of sightseeing: look for gifts at Southern Paua Shop & Factory and then get up close to creatures of the deep with a dolphin and whale watching tour. For where to stay, reviews, and more tourist information, read our Kaikoura trip builder. Drive from Christchurch to Kaikoura in 2.5 hours. Alternatively, you can take a bus. Wrap up your sightseeing on the 19th (Fri) to allow time to drive to Franz Josef. Start off your visit on the 20th (Sat): look and learn at Sir Edmund Hillary Alpine Centre and then trek along Kea Point Walk. Get ready for a full day of sightseeing on the 21st (Sun): soothe aching muscles at some of the top local wellness centers, then go for a walk through Tatare Tunnels Walk, then identify plant and animal life at West Coast Wildlife Centre, and finally take an unforgettable tour with a helicopter tour. 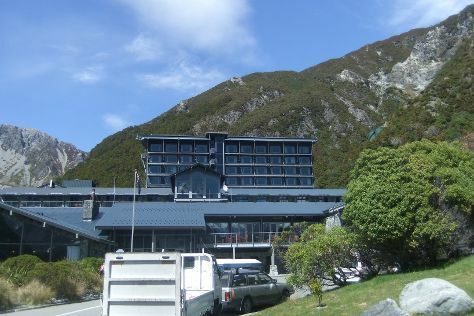 For where to stay, traveler tips, other places to visit, and tourist information, read Franz Josef trip itinerary planner. Drive from Kaikoura to Franz Josef in 7 hours. Alternatively, you can take a bus. Finish your sightseeing early on the 21st (Sun) so you can drive to Hokitika. Hokitika is a township in the West Coast region of New Zealand's South Island, 40km south of Greymouth, and close to the mouth of the Hokitika River. On the 22nd (Mon), take in the exciting artwork at Wilderness Gallery, view the masterpieces at Bonz N Stonz, take in the exciting artwork at Hokitika Craft Gallery Co-op, then identify plant and animal life at Lake Kaniere Scenic Reserve, and finally steep yourself in history at Shantytown. On your second day here, look for all kinds of wild species at Westcoast Treetop Walk & Cafe, take in the dramatic natural features at Hokitika Gorge Scenic Reserve, then stop by Garth Wilson Jade, and finally browse the exhibits of Tectonic Jade. For where to stay, reviews, maps, and tourist information, read our Hokitika sightseeing planner. You can drive from Franz Josef to Hokitika in 2 hours. Alternatively, you can take a bus. Wrap up your sightseeing by early afternoon on the 24th (Wed) to allow time for travel back home.